If you’re like millions of other Americans and folks around the world, you’ve already taken the #IceBucketChallenge. Indeed, over $41 million —and growing—have been donated to the cause that has gone viral on social media since late July. The beneficiary of this campaign is the A.L.S. Association, a nonprofit aimed at funding research for enhancing treatment of amyotrophic lateral sclerosis (ALS). 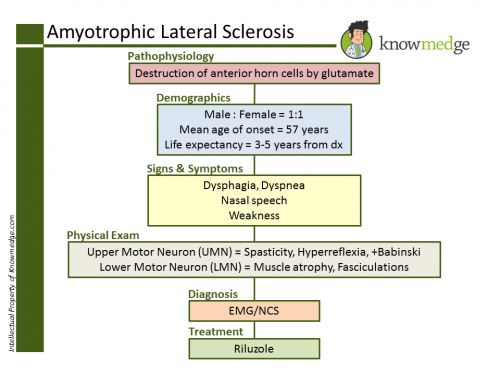 Here’s what you need to know about ALS (also known as Lou Gehrig’s disease) for the USMLE Step, ABIM certification and Maintenance of Certification (MOC) exams. One of the unique characteristics of ALS is that it affects both the upper and the lower motor neurons. No other condition that you need to know for the boards has this hallmark. The pathophysiology of the condition is believed to be via destruction of anterior horn cells by glutamate. Both men and women are affected at about the same frequency. Less than 10% of cases are familial. One potential genetic cause is the copper-zinc superoxide dismutase (SOD1) gene which is found on chromosome 21 and is transmitted in an autosomal dominant fashion. The mean age of onset is 57 years. Life expectancy is between 3 and 5 years from the time of diagnosis. Respiratory conditions like aspiration pneumonia are the most common cause of death in affected patients. The diagnosis of ALS is made by obtaining an electromyogram (EMG) and nerve conduction study (NCS) that shows diffuse UMN and LMN injury, not conforming to nerve root distribution. No abnormalities on cerebrospinal fluid analysis or cervical spine imaging are seen in ALS. Part of the appeal of donating to the fight against ALS is the paucity of treatment options. No cure exists for this horrible disease. Currently, the only FDA-approved medication for ALS is riluzole, a glutamate antagonist. It prolongs survival by about three months as studied in clinical trials. &#149 Percutaneous endoscopic gastrostomy (PEG) tube improves quality of life by assuring proper caloric intake, hydration, and an alternative method of administering medications. &#149 BiPAP therapy can be initiated in patients who have respiratory compromise. The next time you view a #IceBucketChallenge post from one of your friends on your Facebook NewsFeed, quiz yourself on the important points related to Lou Gehrig’s Disease listed above. 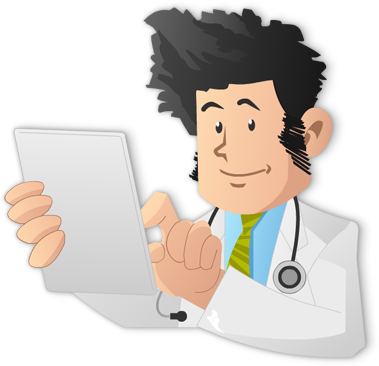 That way, you’ll be ready for any ALS question you encounter on your USMLE Step, ABIM, and MOC exams.